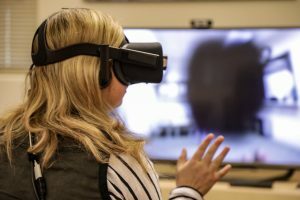 CI Nursing senior students engaged in first virtual reality experience these past two weeks, as they became Alfred James, a 74-year old male with macular degeneration and hearing loss. 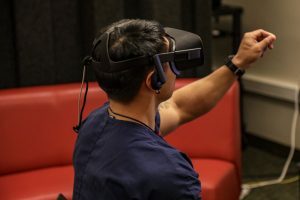 By putting on the VR headset, student embodied Alfred, encountering what it truly means to have hearing loss and visual impairment when engaging with family members or navigating a physician office visit. The large black blob in the middle of the visual field mimics the amount of visual field loss that occurs with macular degeneration making day to day activities such as filling out a form, or managing a meal challenging. When I first became Alfred, I had an immediate and clear link to the reason behind why a patient may slightly tilt their head to look at me (the nurse) from the periphery, without ever stating any type of vision loss. Fascinating to be put in their shoes and have a better perspective … you can read about these issues but you can never fully understand it… it will definitely help me in my nursing career. This is an experience that if you don’t gain empathy from, I would be shocked. 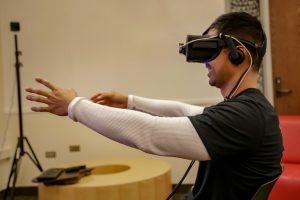 Virtual reality experiences using Embodied Labs seems to offer a new perspective, and deepens students’ connections to how the patient is feeling. Empathy, which can be hard to measure or even teach, is critical in nursing care, therefore important in nursing student education. What better way to teach a disease process by living it? Want to hear more? KCLU Radio interviewed during the virtual reality experience which is expected to air in May; or drop by the FIT Studio to see what is happening!